Lately, fighting for financial justice feels a bit like yelling into the void. Policy decisions and industry practices have determined which groups are encouraged to build and acquire wealth, and which groups struggle to join the financial mainstream. The results are reflected in the composition of our communities, where many neighborhoods segregated by redlining are still trying to recover from the foreclosure crisis and some are now fighting the forces of gentrification, and in banking deserts in low-income and rural areas and communities of color where payday lenders thrive. And now, the current federal deregulatory agenda threatens to accelerate the widening inequality gaps. Our mission is to reform financial system inequities. Fortunately, we are not alone in this fight. From March 11-13 this year, Woodstock Institute staff joined housing and civil rights advocates, community organizers, academics, policymakers, small business owners, and concerned financial institutions and policymakers at the National Community Reinvestment Coalition (NCRC)’s 2019 “Just Economy” conference held in Washington, D.C. Woodstock Institute staff and our Illinois allies were among a record crowd of over 1,100 attendees from all over the country. Members of the National Community Reinvestment Coalition join NCRC CEO Jesse Van Tol at the 2019 NCRC Just Economy Conference. One of the major conference themes was the need to strengthen and modernize the Community Reinvestment Act (CRA). 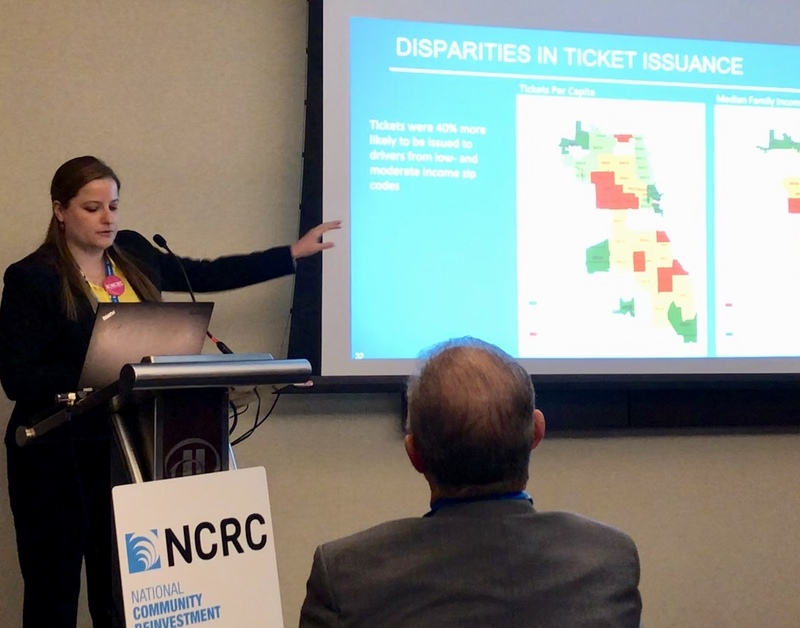 The CRA, a landmark civil rights law created to tackle redlining, requires banks to meet the credit and financial needs of low- and moderate-income people and communities. The Federal Reserve Board of Governor’s Lael Brainard addressed the conference on March 12 with a very detailed and thoughtful keynote about how to strengthen the CRA and the importance of the three federal banking regulators working together on proposed changes. Among other things, we were heartened to hear Governor Brainard stress the ongoing importance of physical bank branches. Governor Brainard’s remarks followed Federal Reserve Chair Jerome Powell’s prerecorded video recognizing NCRC’s critical role in community development. Woodstock President Dory Rand joins the NCRC Board and Lael Brainard of the Board of Governors of the Federal Reserve System. Attendees also heard interesting keynotes and conversations with Color of Money author Mehrsa Baradaran of University of Georgia, Brian Montgomery of the U.S. Department of Housing and Urban Development, NCRC CEO Jesse Van Tol and President and Founder John Taylor, Kat Taylor of Beneficial State Bank, and Pulitzer Prize-winning journalist, filmmaker, author, and immigrant dignity activist Jose Antonio Vargas. Stella Adams received the NCRC Global Lifetime Achievement Award at the NCRC National Awards Dinner on March 11 for her work to promote community education and her involvement in fair housing and fair lending across the country. She recently retired from serving as NCRC’s Chief for Equity and Inclusion. On the following evening, bankers, regulators, and activists alike hit the dance floor to the rhythms of a rocking symphony at the Chairman’s reception. This year’s Just Economy conference included a robust agenda of workshops on lending, organizing, policy, entrepreneurship, housing, and addressing local issues. Woodstock Institute was well represented among the conference workshops. President Dory Rand moderated and Research Director Lauren Nolan presented on a panel in the workshop on “How fines, fees, and the criminalization of debt strip wealth” where we shared the work of our four-part national Enforcing Inequality report on consumer debt, which we developed in collaboration with our partners from California Reinvestment Coalition (CA), the Maryland Consumer Rights Coalition (MD), and Reinvestment Partners (NC). Research Director Lauren Nolan presents findings from our “Debt Spiral” report. Senior Vice President of Policy & Communication Brent Adams presented on a panel on “How states are stepping up for consumers,” where he shared insights on our campaign opposing the industry’s proposed check-cashing rate hike and our success in leading the effort for Illinois to adopt a policy requiring the state to assess racial impacts and impacts on protected classes before raising caps on check-cashing fees (putting into law the first racial equity impact requirement for any state – to our knowledge). Lauren Nolan presented our Aging in Place research on a panel on older adults entitled “Everybody under one roof: Multigenerational housing.” Dory Rand moderated a panel on the Consumer Financial Protection Bureau entitled “CFPB 2.0.,” which discussed the Trump administration’s impact on the Bureau, including the recent decision to gut the payday loan protections developed and finalized by the Bureau’s first director, Obama-appointee Richard Cordray. 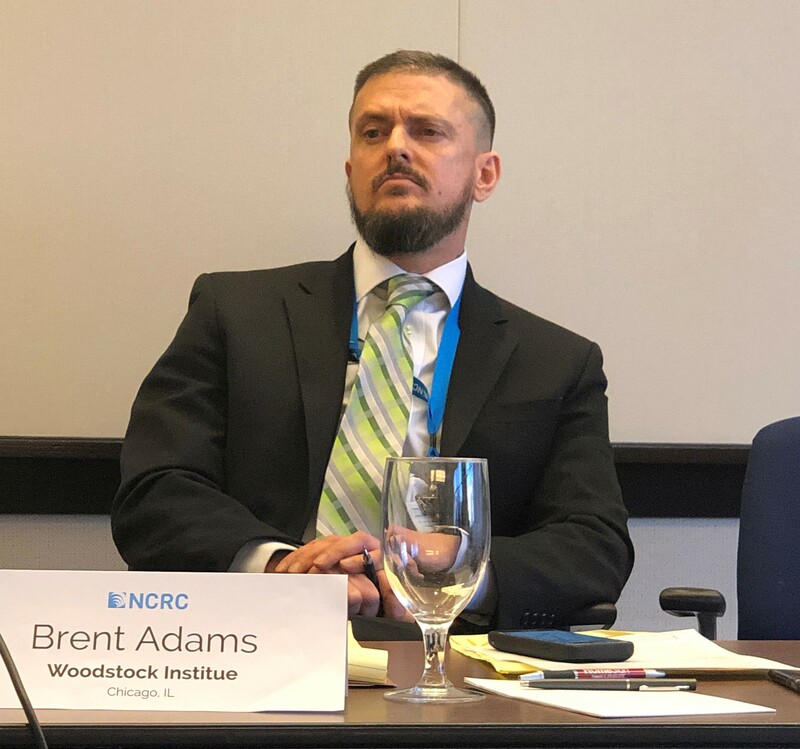 Brent Adams presents on state advocacy efforts at the 2019 NCRC Just Economy Conference. Our time in D.C. included annual Capitol Hill visits with our elected officials. Brent Adams helped lead a group of 17 folks from Illinois to meet with 14 members of the Illinois Congressional Delegation and/or their staffs. (Fourteen visits is more than any other state!) Visits included Senator Tammy Duckworth; Representatives Sean Casten, Jesus “Chuy” Garcia, and Bill Foster of the House Financial Services Committee; and Representatives Danny Davis, Rodney Davis, Jan Schakowsky, Robin Kelly, Lauren Underwood, Cheri Bustos, Daniel Lipinski, Brad Schneider, Raja Krishnamoorthi, and Bobby Rush. Advocates meeting with Representative Sean Casten. 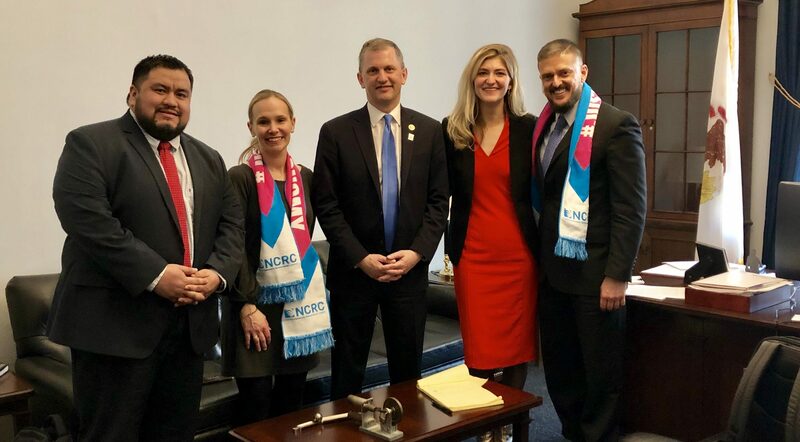 From left to right: Isaias Solis, Kristen Komara, Representative Sean Casten, Jenna Severson, and Brent Adams. In our meetings, we raised concerns about attacks on the CRA, keeping strong affordable housing goals as part of any reform of Fannie Mae and Freddie Mac (the government sponsored entities that purchase mortgages on the secondary market), defending the payday lending protections, and appropriating funds for programs such as the Community Development Financial Institution (CDFI) Fund and housing counseling. Hill Day concluded with a Congressional luncheon, where U.S. Representatives Gregory Meeks, Wm. Lacy Clay, and Al Green addressed the conference attendees. 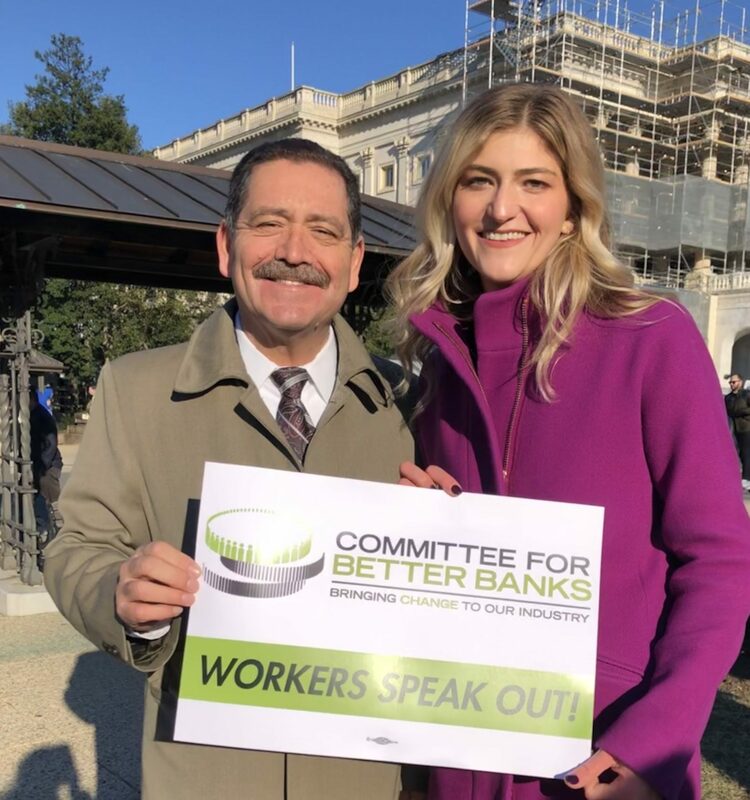 Representative Chuy Garcia and Jenna Severson outside the Capitol for a press conference on holding banks accountable to community and worker needs in March 2019. A key takeaway from the conference as a whole and from Hill Day in particular is that we have formidable challenges ahead of us, but we are fortunate to have allies in Congress and at our partner organizations that will enable us to make a real, positive impact on the lives of consumers.